I do love to talk running (and racing and biking and swimming and spinning and kayaking and stand-up paddleboarding and now Jillian Michaels DVD’ing), but in this down time after my third full marathon, I have another kind of marathon in mind: a writing marathon! Yes, I plan to spend the month of November attempting to write 50,000 words of a novel. I have always wanted to write a novel. Well, to be perfectly honest, I have always wanted to have written a novel. The actual writing work scares the heck out of me. But while the daunting task of writing an average of 1,667 words per day intimidates me, I will not let that stop me. 1. Setting concrete, measurable goals along the way to your main goal can keep you motivated. 2. If you want to grow as a person, do one thing a day that scares you. It’s okay. You might make mistakes, but you’ll learn along the way. 3. There is nothing more satisfying than completing an intimidating task. 4. You must put in the time and effort if you want to see results. 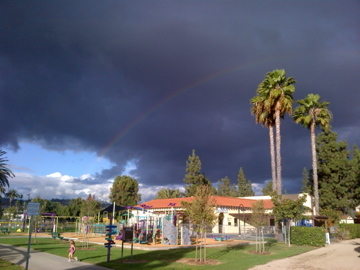 While I don’t really believe it rained in Southern California and then had the sun come out at just the right time for me to see a sign, I do think that seeing that rainbow made a nice little reward for my taking the time to write about my big goal while my daughter played happily at the park. Have you ever participated in National Novel Writing Month? (I’ve survived a few rounds of National Blog Posting Month but never attempted NaNoWriMo.) What kinds of challenges do you like to take on in the down time for your training? 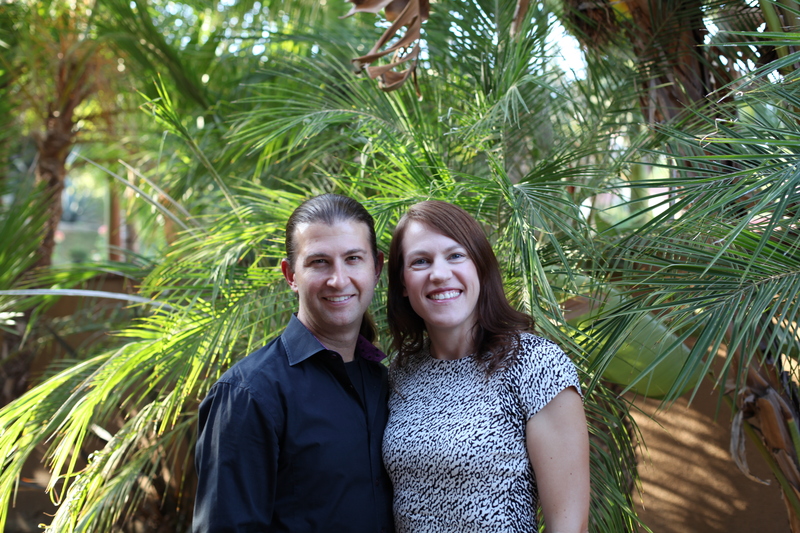 It’s two days after the 2013 Long Beach Marathon and the experience still feels surreal in a good way. Anytime I wonder if it really happened though, my sore muscles remind me of the reality! My family dropped me off at the Convention Center on Saturday at 5 p.m. with just an hour to spare before the expo closed. I don’t like to cut it that close but that’s what a Fit Fun Mom does when her eldest daughter has a Saturday tennis match (she won!) and her middle daughter has ballet rehearsals for the Nutcracker. Thank goodness the drive to Long Beach only took 45 minutes and there was zero wait to pick up my bib once I got there. T-shirt pickup was a breeze as well, and as a bonus I actually like the short-sleeved women’s fit blue tech shirt with a nice design wrapping around the bottom. I’m not a huge fan of expos in general but I did wander around. Lucky for me I happened upon the booth for the Clif Bar Pace Team. They were offering free pace bands and I quickly snatched one up for a 3:45 marathon. I’ve never seen those offered before. I know you can print your own pace wristband or order a pace temporary tattoo, but what a nice touch for the sponsor to offer free pace bands at the expo! I booked an early reservation at La Traviata for some fish, pasta and bread for Saturday night dinner. As I’ve mentioned before, one of my main goals for my third marathon was to focus on pre-race and race nutrition and do my best not to bonk during the race. I planned to eat a dinner with lean protein and plenty of carbs at about 6 p.m., followed by an early bedtime. I got to sleep around 9:30 and felt ready to get up before my alarm even went off at 3:45 a.m. It wasn’t hard at all to get up. The hard part was trying to choke down a bagel with strawberry jam, followed by some oatmeal and a banana. Based on information from The New Rules of Marathon and Half-Marathon Nutrition: A Cutting-Edge Plan to Fuel Your Body Beyond “the Wall” , I had calculated exactly the number of grams of carbohydrates I should consume two hours before the race based upon my body weight. It turns out that eating that much is a lot easier said than done though. Before a race, my body is busy emptying out, if you know what I mean, and really is not all that interested in taking anything in. Only the banana tasted good and the rest tasted like cardboard (even though I’ve had no problem eating those foods before long runs, when I’m not suffering from race jitters!) I washed what I could down with a cup of coffee and called it good. I was out the door by 4:30 a.m. and at the start by 4:45 a.m. With an impressive row of porta potties, I never had to wait more than a few minutes (I imagine it might have been a different story when the masses of half marathoners showed up for their 7:30 start after the 6 a.m. full marathon start). I entered the corral at 5:30 a.m. and seeded myself near the 3:45 pacer. I eventually set my throwaway clothes in a pile off to the side to be picked up for donation. It wasn’t chilly, which didn’t bode well for cool race temperatures. Still it was gorgeous out in the pre-dawn. I chatted with a very nice man next to me about how this would be his 44th marathon. I only wish I’d gotten his name so I could check up on him after the race. We said hello again at the 7-mile mark but I never saw him again. We were all quite disappointed when the race start was delayed 20 minutes due to waiting for the police to secure the course. I certainly understand that need and I can see how it’s an even bigger issue in a port city like Long Beach, but when you’ve timed your race nutrition down to the minute it’s a bummer to wait that long. Still, everyone stayed in good spirits and all the runners were very well behaved during the mass start. Part of my “do not bonk” plan was to go out 5-10 seconds slower than 8:35 race pace for the first three miles. The course felt a little crowded for the first several miles and I basically went with the flow. It helped that I hadn’t wanted to go out fast because it helped me resist the urge to waste energy by dodging and passing other runners. The first half of the Long Beach course is gorgeous. You get treated to a spectacular view of the Queen Mary and a fireboat spraying all of its hoses high in the air in tribute to the runners. There was still a marine layer of clouds covering the sun and it was perfect running weather to start. I felt lucky to be there, running someplace new to me and feeling good on fresh legs. At mile 7 you hit the beach path. I’d heard in prior years, before they split the half and full marathon start times, this part of the course could be a bottleneck but it wasn’t (except where pace groups took up the whole path, and I just stayed a nice distance behind the 3:45 pacer). I saw my family just after mile 7 and they handed off a bottle of Fluid to me. All smiles on the beach path at mile 7. I wore neon pink so my family could see me a mile away (their words)! I got lots of “Go Mama” and “I love you” and it was a huge boost to me — and to many others around me who heard all the happy chatter! I felt great for the first half of the race and thoroughly enjoyed it. 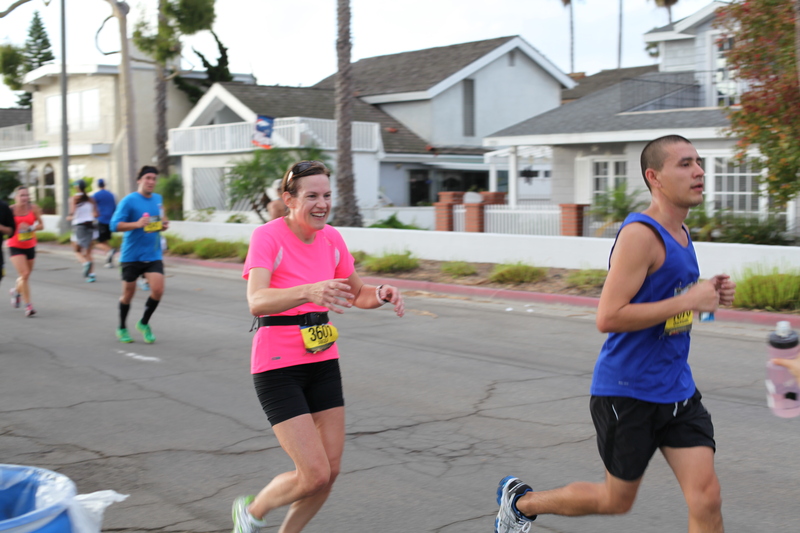 After the 13th mile, my mindset changed and while I was still enjoying the race, the intensity of my focus increased. I had crossed the half marathon timing mat at a gun time of 1:52:42, which was 1:51:57 chip time. My family met me with another bottle of sports drink and I was ready conquer the second half of the course. 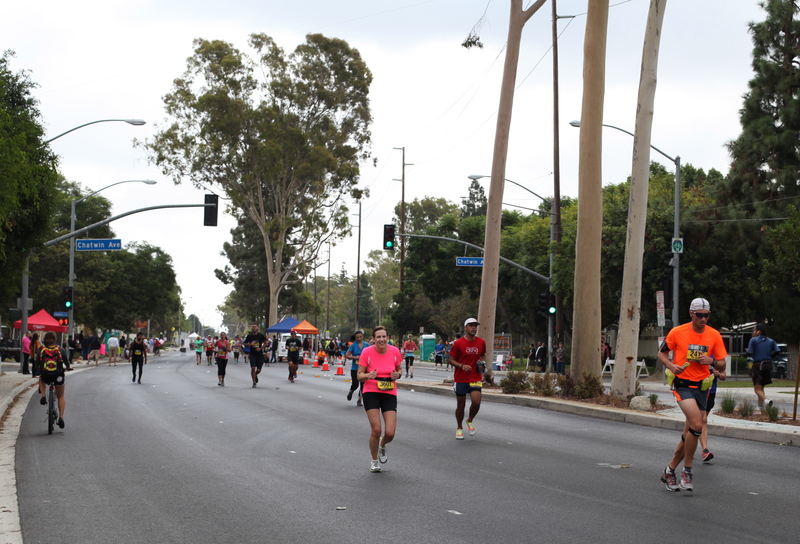 For the recap of the second half of the race, continue reading at Long Beach Marathon Recap — Part II. Me reaching for a sports bottle from my 5-year-old at the 13-mile mark. 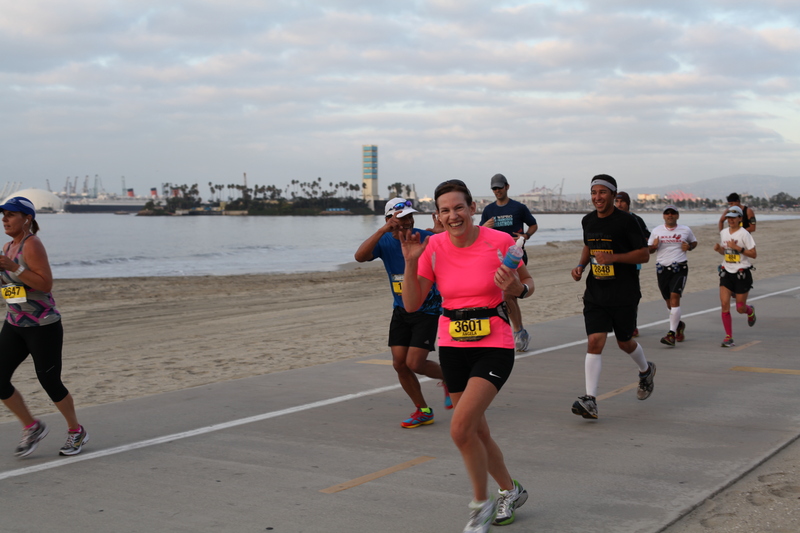 Just a quick note to say that I really enjoyed the Long Beach Marathon and the race went well for me. I’m still waiting on an official time but according to my Garmin (which in all the excitement I forgot to stop right away at the finish line) I came in around 3:53, a personal record for me. I am super sore but super happy, and will write up a full race report when I’m done celebrating!